რობერტ დაუნი უმცროსი (ინგლ. Robert Downey, Jr.; დ. 4 აპრილი, 1965) — ამერიკელი მსახიობი. მისი საეკრანო დებიუტი შედგა 1970 წელს, 5 წლის ასაკში, მამის, რობერტ დაუნი უფროსის მიერ გადაღებულ ფილმში „ფუნტი“. 1980-იან წლებში იგი თამაშობდა ფილმებში მოზარდების შესახებ. პირველი დიდი აღიარება მოიპოვა ფილმით „ნულზე ნაკლები“. 1992 წელს, ფილმში „ჩაპლინი“ შესრულებულმა მთავარმა როლმა მას მოუტანა ოსკარის ნომინაცია საუკეთესო მსახიობის კატეგორიაში. უკანასკნელ ცნობილ როლებს შორის არის: ტონი სტარკი რკინის კაცის შესახებ ფილმების სერიაში და შერლოკ ჰოლმზი (2009 და 2011 წლების ეკრანიზაციებში. ჟურნალ Forbes-ის მონაცემებით წელიწადში 75 მლნ აშშ დოლარით რობერტ დაუნი უმცროსი ჰოლივუდის ყველაზე მაღალანაზღაურებადი მსახიობია. შეგიძლიათ იხილოთ მედიაფაილები თემაზე „რობერტ დაუნი უმცროსი“ ვიკისაწყობში. ↑ 1.0 1.1 Robert Downey Jr.'s First-Ever Movie Appearance Was Pretty Absurd. Time (1 July 2014). წაკითხვის თარიღი: 29 August 2014. ↑ (2009) Encyclopedia of Weird Western: Supernatural and Science Fiction Elements in Novels, Pulps, Comics, Films, Television, and Games. Jefferson, N.C.: McFarland & Co., Publishers, გვ. 103. ISBN 978-0-7864-4390-1. ↑ The Resurrection of a Renegade's Scotch-Tape Films. The New York Times (29 August 2008). წაკითხვის თარიღი: 15 September 2014. ↑ Erickson, Hal (2012) Military Comedy Films: A Critical Survey and Filmography of Hollywood Releases Since 1918. Jefferson, N.C.: McFarland & Co., Publishers, გვ. 261. ISBN 978-0-7864-6290-2. ↑ 5.0 5.1 5.2 Robert Downey Jr. Credits. TV Guide. წაკითხვის თარიღი: 29 August 2014. ↑ Tuff Turf. The Austin Chronicle (25 January 1985). წაკითხვის თარიღი: 29 August 2014. ↑ How 1985's Girls Just Want to Have Fun Set the Template for All Future Dance Movies. Vulture (20 September 2013). წაკითხვის თარიღი: 15 September 2014. ↑ 8.0 8.1 8.2 8.3 8.4 8.5 8.6 Robert Downey Jr.'s Weird Science of Acting. Rolling Stone (19 May 1988). წაკითხვის თარიღი: 29 August 2014. ↑ Deadwait (1985). Rotten Tomatoes. წაკითხვის თარიღი: 12 May 2013. ↑ Riper, A. Bowdoin Van (2011) A Biographical Encyclopedia of Scientists and Inventors in American Film and TV since 1930. Lanham: Rowman & Littlefield Pub. Group, გვ. 200. ISBN 978-0-8108-8129-7. ↑ Chances Are Movie Review & Film Summary. Roger Ebert (10 March 1989). წაკითხვის თარიღი: 29 August 2014. ↑ 12.0 12.1 12.2 12.3 12.4 12.5 Profile: Robert Downey Jr.. GQ (April 2013). წაკითხვის თარიღი: 29 August 2014. ↑ Too Much Sun (1990) Review/Film; When You're Gay But Must Beget an Heir. The New York Times (25 January 1991). წაკითხვის თარიღი: 29 August 2014. ↑ Soapdish Movie Review & Film Summary. Roger Ebert (31 May 1991). წაკითხვის თარიღი: 29 August 2014. ↑ FILM; Robert Downey Jr. Is Chaplin (on Screen) and a Child (Off). The New York Times (20 December 1992). წაკითხვის თარიღი: 29 August 2014. ↑ Heart and Souls (1993). Entertainment Weekly (13 August 1993). წაკითხვის თარიღი: 29 August 2014. ↑ Robert Downey Jr: 21 Years Ago. GQ (April 2013). წაკითხვის თარიღი: 29 August 2014. ↑ Short Cuts. Rolling Stone (3 October 1993). წაკითხვის თარიღი: 29 August 2014. ↑ Hail Caesar (1994). The New York Times. წაკითხვის თარიღი: 2 September 2014. ↑ See the Cast of ‘Natural Born Killers’ Then and Now. Screen Crush. წაკითხვის თარიღი: 2 September 2014. ↑ Only You Movie Review & Film Summary (1994). Roger Ebert (7 October 1994). წაკითხვის თარიღი: 2 September 2014. ↑ Richard III Review. Entertainment Weekly (19 January 1996). წაკითხვის თარიღი: 2 September 2014. ↑ Home for The Holidays Movie Review (1995). Roger Ebert (3 November 1995). წაკითხვის თარიღი: 2 September 2014. ↑ Signoff;They're Not All Just Merry Little Reruns. The New York Times (26 November 1995). წაკითხვის თარიღი: 2 September 2014. ↑ Doctor, doctor, can anyone save Robert Downey Jr's Restoration?. The Guardian (6 September 2012). წაკითხვის თარიღი: 2 September 2014. ↑ Danger Zone Review. Entertainment Weekly (17 January 1997). წაკითხვის თარიღი: 2 September 2014. ↑ Wesley Snipes interview: 'Robert Downey Jr called me for advice about რკინის კაცი (9 August 2014). The Daily Telegraph. წაკითხვის თარიღი: 2 September 2014. ↑ Review: Downey scores with 'Two Girls and a Guy'. CNN (26 May 1998). წაკითხვის თარიღი: 2 September 2014. ↑ 'Hugo Pool' Doesn't Reflect Well on Downeys Jr. and Sr.. Los Angeles Times (12 December 1997). წაკითხვის თარიღი: 2 September 2014. ↑ 30.0 30.1 Robert Downey Jr. returns to TIFF as its leading man. Toronto Star (27 August 2014). წაკითხვის თარიღი: 2 September 2014. ↑ In Dreams Movie Review & Film Review (1999). Roger Ebert (15 January 1999). წაკითხვის თარიღი: 2 September 2014. ↑ Friends & Lovers Movie Review. Roger Ebert (30 April 1999). წაკითხვის თარიღი: 2 September 2014. ↑ Murphy Never Better Than In Oz's `Bowfinger'. Hartford Courant (22 August 1999). წაკითხვის თარიღი: 2 September 2014. ↑ Black and White Movie Review & Film Summary (2000). Roger Ebert (5 April 2000). წაკითხვის თარიღი: 2 September 2014. 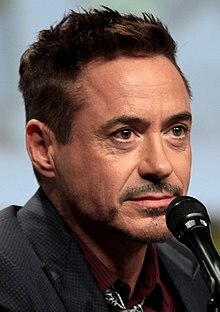 ↑ Robert Downey, Jr? Call Him Mr. Clean. W (March 2007). წაკითხვის თარიღი: 2 September 2014. ↑ A Visual Feast: An Interview with the Director of Jiro Dreams of Sushi. Vogue (9 March 2012). წაკითხვის თარიღი: 15 September 2014. ↑ A Leap of Faith Produces a Do-It-Yourself First Album. The New York Times (31 July 2005). წაკითხვის თარიღი: 15 September 2014. ↑ Charlie: The Life & Art of Charles Chaplin Saturday, August 2. TCM. წაკითხვის თარიღი: 2 September 2014. ↑ Robert Downey Jr.'s 'Gothika'. CBS News (21 November 2003). წაკითხვის თარიღი: 15 September 2014. ↑ Eros Movie Review & Film Summary. Roger Ebert (8 April 2005). წაკითხვის თარიღი: 29 August 2014. ↑ Randy Laist (2010). Technology and Postmodern Subjectivity in Don DeLillo's Novels. New York: Peter Lang, გვ. 151. ISBN 978-1-4331-0841-9. ↑ Jason Guerrasio. (16 June 2006) Agent Provocateur. Filmmaker Magazine. წაკითხვის თარიღი: 12 May 2013. ↑ Good Night, and Good Luck Movie Review. Roger Ebert (20 October 2005). წაკითხვის თარიღი: 29 August 2014. ↑ Review: 'Hubert Selby Jr.: It/ll Be Better Tomorrow'. Variety (14 September 2005). წაკითხვის თარიღი: 29 August 2014. ↑ The Old Neighborhood Never Looked So Grim. The New York Times (29 September 2006). წაკითხვის თარიღი: 2 September 2014. ↑ The Shaggy Dog Movie Review. Roger Ebert (9 March 2006). წაკითხვის თარიღი: 29 August 2014. ↑ 'A Scanner Darkly': Keanu Reeves, Undercover and Flying High on a Paranoid Head Trip. The New York Times (7 July 2006). წაკითხვის თარიღი: 29 August 2014. ↑ Fur: An Imaginary Portrait of Diane Arbus. Roger Ebert (16 November 2006). წაკითხვის თარიღი: 2 September 2014. ↑ So Who Was the Zodiac Killer?. The Guardian (14 April 2007). წაკითხვის თარიღი: 2 September 2014. ↑ High School's the Same; the Drugs Have Changed. The New York Times (22 February 2008). წაკითხვის თარიღი: 2 September 2014. ↑ Terrence Howard Accuses Robert Downey Jr. of 'რკინის კაცი' Sabotage. The Hollywood Reporter (15 November 2013). წაკითხვის თარიღი: 29 August 2014. ↑ New Marvel Short Film Explains The End Of The Incredible Hulk. Cinema Blend (2 August 2011). წაკითხვის თარიღი: 2 September 2014. ↑ Robert Downey Jr on The Soloist. The Telegraph (14 September 2009). წაკითხვის თარიღი: 2 September 2014. ↑ More 'რკინის კაცი'? Sounds good to me, Robert Downey Jr. says. CNN (23 July 2014). წაკითხვის თარიღი: 29 August 2014. ↑ False Advertising: Poster for Love & Distrust "Starring" Robert Pattinson, Robert Downey Jr., and Sam Worthington. Collider (2010). წაკითხვის თარიღი: 2 September 2014. ↑ Robert Downey Jr. and Zach Galifianakis comedy 'Due Date': Can We Be Part of this Wolf Pack?. Entertainment Weekly (15 July 2010). წაკითხვის თარიღი: 2 September 2014. ↑ შერლოკ ჰოლმზი: A Game of Shadows – Review (2011). The New York Times (15 December 2011). წაკითხვის თარიღი: 2 September 2014. ↑ Robert Downey Jr. Calls ‘Guardians of the Galaxy’ the Best Marvel Movie Yet. Variety (28 August 2014). წაკითხვის თარიღი: 2 September 2014. ↑ 59.0 59.1 59.2 59.3 59.4 Robert Downey Jr. on 'რკინის კაცი 4': 'Why Give Up the Belt?'. Entertainment Weekly (22 July 2014). წაკითხვის თარიღი: 29 August 2014. ↑ ‘Chef’ Review: Jon Favreau Cooks for Himself, But Where's the Flavor?. The Wrap (7 May 2014). წაკითხვის თარიღი: 2 September 2014. ↑ Kit, Borys. (21 April 2016) Robert Downey Jr. Joins 'Spider-Man: Homecoming'. The Hollywood Reporter. დაარქივებულია ორიგინალიდან - 21 April 2016. წაკითხვის თარიღი: 21 April 2016.
ეს გვერდი ბოლოს დარედაქტირდა: 11:27, 7 მარტი 2019.